Arms embargo issue the latest in last-minute demands as a Tuesday deadline for a final deal looms ahead. Iran has demanded yet another concession in nuclear talks with the West on Monday - this time, to end the UN arms embargo on the Islamic Republic. 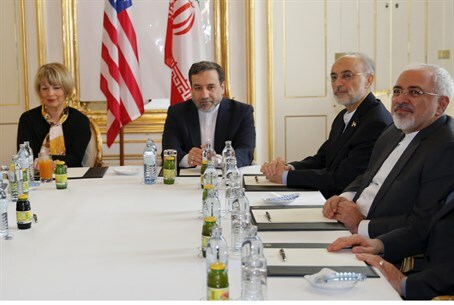 After already having extending the talks several times, Iran and the six major powers set a deadline of June 30 to reach a final deal, but when they once again failed to meet that deadline, they agreed to extend the deadline to July 7. However, with tensions high and progress still incremental just one day before that deadline, Iran announced that it is working with the US and UN to end the arms embargo - a proposal that the US is likely to categorically reject as part of efforts to reduce Iran's firepower, the Associated Press reports. The arms embargo is a separate issue from the lifting of the UN's economic sanctions on the country, and the US has been adamant since a framework deal was formed in April that "important restrictions on conventional arms and ballistic missiles" would be a vital part of a future UN Security Council resolution on the subject. Moreover, Washington believes that lifting the embargo would both further enable Iran to support terror partners in Syria, Yemen, and elsewhere in the Middle East, and also raise even fiercer opposition to the entire deal in Congress and in Israel. However, Iran views all existing UN sanctions as illegal and damaging to its current nuclear program - and the point is likely to stall the talks further even as the deadline looms. Russia and China heavily back the lifting of the arms embargo, which the UN imposed on Iran in 2007 as part of sanctions set to discourage Iran from continuing its nuclear program.